The second of the juveniles, Space Cadet is from 1948 but more improved over Rocket Ship Galileo than the passage of one year would warrant. By 2075, the Earth unified, although not as peacefully as in Rocket Ship Galileo; Denver is a crater, as are other cities. The current peace is enforced by the Patrol and naïve Matt Dodson wants to be one of its many officers. Happily for Matt, he is one of the few good enough for the Patrol to consider but when we meet him, on his way to the academy, he has no idea if he will be one of the majority of washouts or if perhaps he can be polished into the sort of young who might kill a million of his fellow citizens in nuclear fire. In some ways, that sounds like the lead-in to a Lensmen story but the men of the Patrol, while elite in their way, are no super-humans. If you know that this is a story about a young man entering military service1, you can predict the general shape of the story: initial testing to remove the weak, the stupid and the corrupt. induction, training (with more washouts as well as actual fatalities; if there are fatalities, the kind of fatality may indicate where on the idealism <> cynicism scale the story is) and then perhaps a few early assignments to show how effective the training was. Space Cadet is loyal to that model and its cast of characters – solid Matt, blowhard Tex, Venusian Oscar, slimy Burke and superfluous to the plot Pierre2 – are all of familiar types. The training portion is for the most part completely conventional and Matt, Tex and Oscar’s2 first mission, a rescue mission sadly too late to save anyone, mostly notable for being another one of Heinlein’s messages that nuclear war is bad (and also one of the basic tools of the Patrol). The interesting part of the novel comes when Matt, Tex and Oscar are sent to the surface of Venus on another rescue mission. 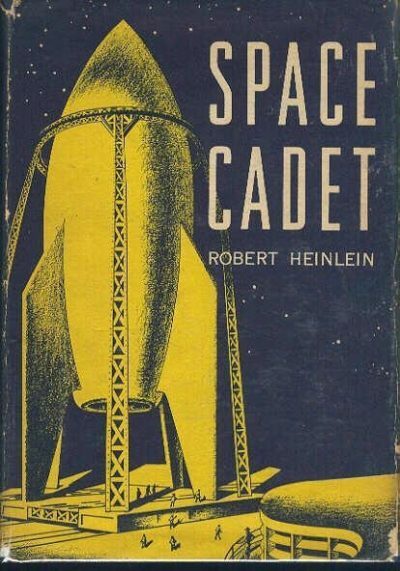 There they find themselves caught between the demands of a human trader and the local aborigines, a conflict that does not play the way someone familiar with the conventions of westerns (or their British equivalent) may expect; early Heinlein often feature aliens more advanced than they appeared and a moral that one should treat other cultures with respect; Space Cadet is one such example. Someone else can mention the cell-phones; what I noticed this time through is that Heinlein makes a point of establishing on the second page the Patrol is not just for earnest white boys, a theme that keeps up through out the book. Perhaps to balance this, the North American Union is said to be the homeland of most of the Patrol. American teens might tell themselves that while the Earth has one government, they at least are running it and who knows? The evidence doesn’t exactly contradict that. Fans expecting a suffragette Patrol woman along the lines of Gloria Brooks McNye should look elsewhere; while Tex has lots of pinups, the other Patrol members seem to openly despise women – one character even calls himself a woman-hater – and the dismal examples of femininity we see explain why Patrol members tend to put off the distasteful business of reproduction until retirement. Speaking of retirement, I wonder if Heinlein’s own service record had anything to do with the discussion of how ungrateful civilians are to be paying pensions to Patrol members still in their 30s? The rockets in this are nicely constrained by realistic performance abilities (although chemical rockets seem to have exhaust velocities about twice as good as the best chemical rockets can have, which is why there are chemically fueled SSTO rockets around. Poor Pierre spends five years in total getting to training and then getting out to his first duty post and he’s only coming in from Jupiter. The book is clearly at the idealistic end of the scale, which makes the disturbing subtext of some details – the loathing the Patrol has for any civilian they come into contact with, the fact that they have a large support of nuclear bombs ready to drop on a supposedly peaceful Earth at a moment’s notice, the fact that one cannot really rule out Matt’s father’s claims about the Patrol being run to benefit the NAU – that much more delightful to notice. It’s entirely possible that Matt is part of a terrible machine and too naïve to realize but at least, unlike my memory of Starship Troopers, the Patrol has ambitions of being lawful good. Whether or not they actually succeed, the Patrol is trying its best. It’s just a shame about the potential megadeaths. Space Cadet is available from Orb (ebook and trade) and from the troubled Virginia Editions (the price eludes me). Yeah, I know people might quibble about “military” but the Patrol uses atomic weapons for crowd control and that counts as military for my purposes. Joseph Lawrence Greene’s original radio script for “Tom Ranger” and the “Space Cadets” may predate Heinlein’s Space Cadet but the actual radio show Tom Corbert Space Cadet sure has close parallels with this Heinlein, with the characters dialed up a bit: Tom is even more boring than Matt, Roger a more grating womanizer than Tex and Astro is even more sort of there than Oscar.